We offer a complete range of professional tree care services, many of which are available year-round. 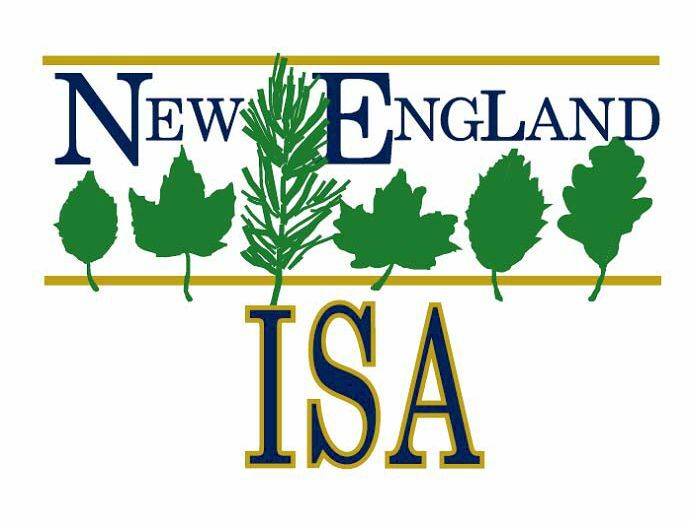 All tree care services will be performed under the direct supervision of an ISA Certified Arborist. Our mission as a company is to exceed customer expectations and produce the highest quality of tree care services available. If we cannot do it safely, then we will not do it at all. To this end, all of our work is done in accordance with ANSI A300 Performance Standards for Tree Care Operations and ANSI Z133.1 Safety Standards. 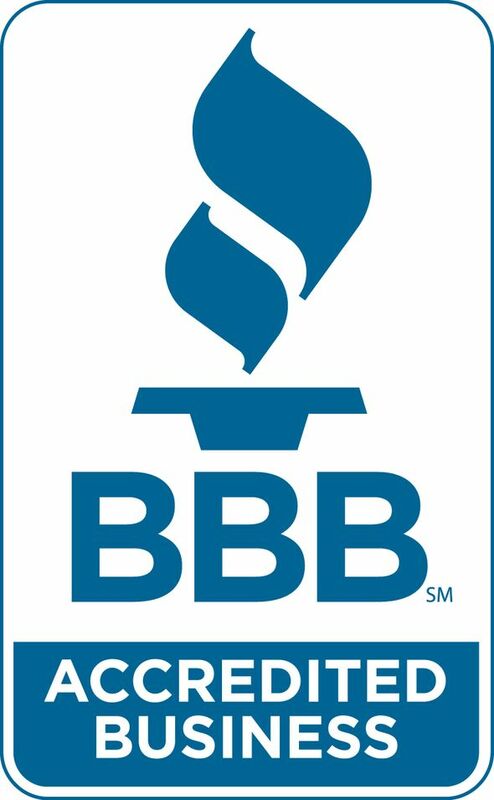 We price every job with the goal of earning repeat business from our clients. We want to be able to spend enough time on your property to provide the highest level of quality, safety, and attention to detail, including superior cleanup before we leave. You will find our pricing to be fair, consistent, and competitive with other high quality and similarly qualified tree care companies. Trees are frequently removed unnecessarily. Emphasizing preventative maintenance, our holistic and tree-friendly approach offers solutions to help your trees thrive and reduce large unexpected tree removal costs in the future. When our arborists look at trees, we are looking for solutions rather than problems. Supplemental Support Systems: Some trees have structural defects that need supplemental support. Examples are cabling, bracing, propping, and guying. Every system is designed with the structure and species of the tree in mind. We do not take the common cookie-cutter approach to placement and hardware selection, because this can do more harm than good in the long term. Instead, we specify the right solution for each individual situation. Lightning Protection Systems: Lightning is not only dangerous, but it can be lethal to trees when it is attracted to tall, exposed trees and uses the trees vascular system as its path to reach the ground. This can cause irreparable damage to the living conductive tissue of the tree. Many homeowners in lightning-prone locations have a lightning protection system (LPS) installed on their home. LPS for trees function similarly, by providing the best path to ground in the event of a lightning strike. Tree Health Care: Healthy trees are more resistant to pests, disease, and environmental stress. We offer a comprehensive array of services to keep your healthy trees healthy and vigorous. We can also diagnose and treat stressed and declining trees with the help of careful assessment, lab analysis and our custom treatment plans. Our arborists are trained to detect subtle issues which may only be visible to the trained eye, and these can be addressed before they become major problems. We emphasize natural and organic solutions, and our Integrated Pest Management-based treatment approach is environmentally responsible and effective. Invasive Insects: We are knowledgeable about the invasive insects threatening trees in our region. Our team includes two VT Forest Pest First Detectors and a Vermont Licensed Applicator. We offer environmentally responsible, effective solutions to protect your trees. Drought Management: We can provide your trees with the nutrients and hydration that they need to survive drought conditions before it's too late. Proper fertilization, feeding, and organic mulch to simulate the optimal growing conditions of rich forest soils. Soil and Root Management: Healthy soil for healthy plants. From correcting nutrient deficiencies to improving soil structure, we have the solutions for the long-term health of your trees and landscape. One of the most important and most often overlooked aspects of tree care, the root system requires maintenance just like the crown. Using specialized high pressure air tools, we can alleviate compacted soil so roots can thrive. Periodic inspection and maintenance of the area where the tree meets the earth can do wonders for the prevention of disease and decline. We can also help mitigate conflicts between tree roots and construction projects, underground utilities, foundations, and hardscapes. Establish pruning objectives - what are the goals for pruning? Consider pruning cycle: how often should the tree be pruned? Crown Cleaning: When done properly, this routine maintenance pruning accelerates natural processes to increase the tree's longevity and beauty. Crown cleaning involves the selective pruning of crossing, crowded, rubbing, weakly attached, broken, diseased and dead branches. This gives mature trees the help they need to promote health and vigor, improve sun and airflow, and help the tree's resources be used more efficiently. Our arborists work systematically throughout the tree, carefully considering each pruning cut before making it. Deadwooding: Removing dead branches improves aesthetics and reduces the risk of them falling on people or property. It also helps the tree heal the area to inhibit entry by harmful pathogens, many of which are attracted to dead branches as a food source. Crown Raising: This is the practice of removing lower branches to increase the distance from the ground to the beginning of the crown. This is often done for aesthetic reasons, to open up a view, or to gain clearance for vehicles or lawnmowers. Young tree pruning: Young trees need periodic structural pruning once they become established. This reduces the need for structural pruning as the tree matures. The way the tree is pruned when it is young defines its structure for the rest of its life. Clearance Trimming: This may be implemented when tree branches are encroaching on a building, powerline, roadway, driveway, parking lot, satellite dish or solar panels. It is important that not too much foliage be removed from the tree at once, and that proper pruning cuts are made so that the tree will be able to heal. Restoration pruning: Trees that have been damaged or improperly pruned may require special pruning to restore their structure. Thinning and Crown Reduction: This is sometimes recommended as a mitigation option for trees that have outgrown their planting site. It is most often implemented by us for large trees to reduce the weight of overextended branches, or reduce the amount of load being applied to a structural defect. Vine removal: Vines can become an aesthetic problem and also a tree health problem. 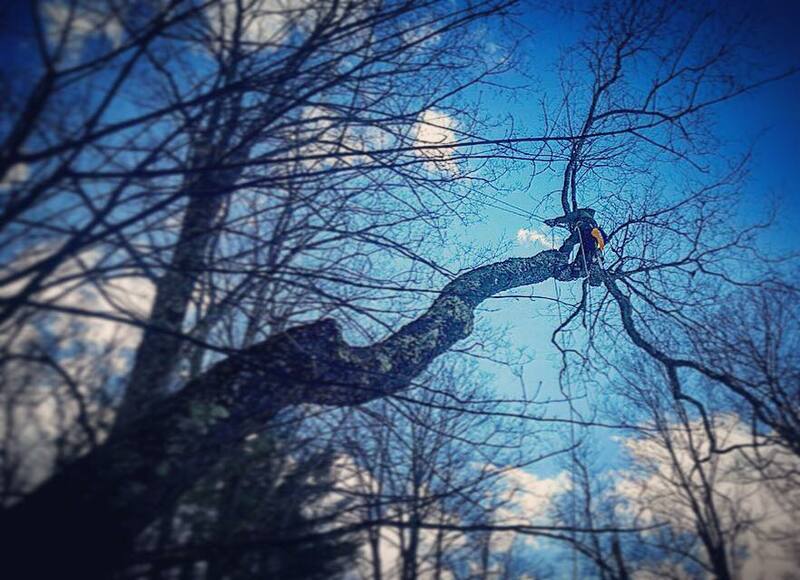 Our arborists can systematically work throughout a tree to remove troublesome vines. Fruit tree pruning: Proper fruit tree pruning involves a unique skillset. Our arborists are knowledgeable about the art and science of fruit tree pruning, and the specific needs of various species. From periodic maintenance to extensive restoration, we can enhance the ornamental value and fruit production of your tree or orchard. It is important to avoid improper pruning, such as topping cuts, over-pruning, or using climbing spikes on any tree except a removal. These practices often permanently damage a tree's structure and health. Excessive stress and wounding makes trees more vulnerable to pests and disease. As tree health declines, they can become dangerous, ugly and eventually require expensive removal or restoration pruning. Please see our Links page for more information on the definition of topping and why topping hurts trees. Some trees may pose an unacceptable level of risk due to structural defects. Dead trees have a higher risk of structural failure. It is safer and more economical to remove a dying tree before it is dead. Perhaps it is too late or impossible to mitigate health problems. Healthy trees are sometimes removed because the right tree was planted in the wrong place, such as too close to a building or utility line. 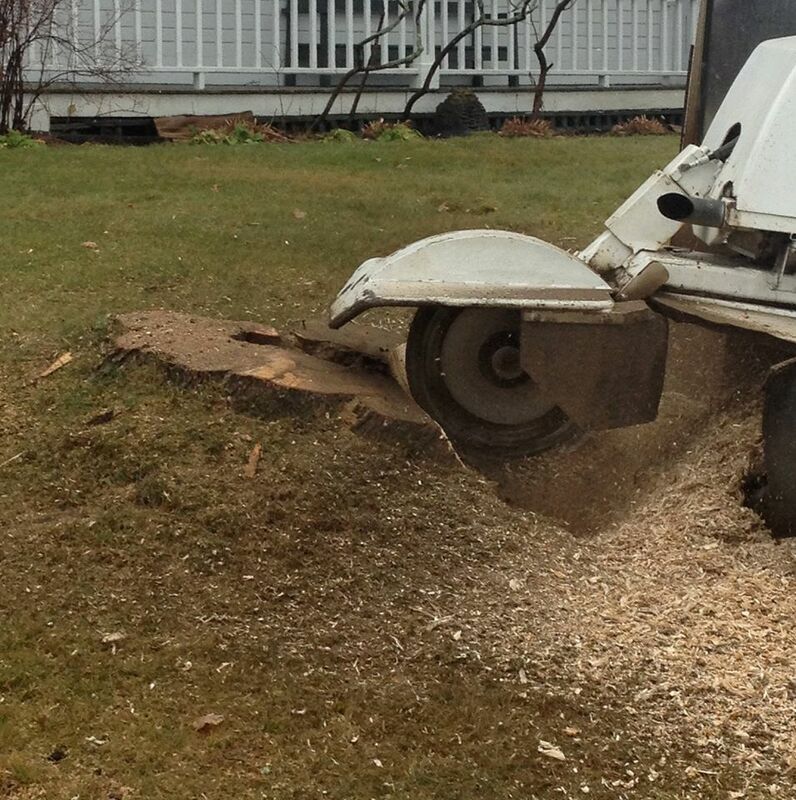 Stump grinding is available to complement our tree removal services. We always "flush cut" all our stumps low and level with the ground whenever possible. 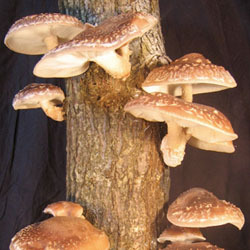 You may also be interested in our gourmet mushroom inoculation services as an alternative to stump grinding. We offer stump & log inoculation with gourmet mushrooms including shiitake, oyster, chicken of the woods, turkey tail and lion's mane. Growing edible/medicinal mushrooms is an alternative to stump grinding and a great use for stumps or logs from your tree care project. We offer a wide variety of approaches and equipment to meet your view enhancement goals. In some cases, we can enhance your view by pruning rather than removing trees, or by selectively thinning rather than clearing. Our goal is to provide sustainable and budget-friendly options to enhance your view. Storm damaged trees present a unique set of hazards. You can count on our team to assess and properly mitigate storm damaged trees on your property. We provide prompt written proposals to you and/or your insurance company. From pruning broken or hanging branches, to removing trees from buildings or vehicles, we have you covered. We can also provide tarp/board up service, along with our meticulous cleanup. Invasive plant control - for the health and beauty of your woodlands and to promote the growth of desirable native plant species. Our goal is to use the lowest impact methods practical for effective control. It is never too soon for us to go for a walk in your woods, and evaluate any invasive plant problems before they become serious problems. Each application is customized for your property. Please contact us for a free estimate. If you are in need of consultation beyond the scope of a free estimate, you may be interested in our consulting arborist services. Our goal here is to provide you with information so that you can make more informed decisions for managing your trees.